The town of Morpeth in the North East region of England has suffered from severe flooding in the last decade. The River Wansbeck runs through the middle of the town and connects to the North Sea, approximately 5 miles to the east. In September 2008, the town experienced the heaviest rainfall ever recorded in the area – approximately 6 inches in 48 hours – resulting in the overtopping of the River Wansbeck flood defenses and damage to approximately 1,000 properties. Four years later, river flooding occurred again, although the floodwaters were shallower than in 2008. Oldgate Bridge, Morpeth. Photo by Anthony Foster via Wikimedia Commons. One year prior to the flood of 2008, the national Environment Agency (EA) began planning a flood alleviation scheme for Morpeth. Since the flood, the EA has been working diligently with the local community to help them become more resilient and involve them in the planning of a suitable flood alleviation proposal. The EA has also been working with the Northumberland County Council and Northumbrian Water on the program and assisting these local entities with plans to reduce flood risks from stormwater and improve drainage. The Morpeth Flood Alleviation Scheme, completed in December 2009, proposes a mix of structural and non-structural flooding defenses. The Standard of Protection provided will alleviate the risk of flooding up to a 1 in 137 year return period (or from a flood with a 0.7% chance of happening in any given year), equal to the flood level experienced in 2008. When the plan was completed, funding was sought through a national Flood Defence Grant in Aid (FDGiA) in 2011-12 to provide the share of funds required under the new ‘partnership funding’ regime. However, the grant was not received, so another source of external funding was sought. Recognizing the value of flood protection to the community, the Northumberland County Council committed to contributing between £7 – 12 million towards the £21 million scheme. The local contribution helped the EA secure £10.6 million of government funding under the partnership funding regime. The scheme includes improvements to existing floodwalls, along with realignments and construction of new floodwalls, which began in 2013. The central component to the scheme, however, is the establishment of flood storage areas upstream. Two floodwater detention areas are being constructed. The floodwater storage system at Mitford Estate will be capable of holding back 1.3 million cubic meters of water when it is completed in the autumn of 2014. Another smaller floodwater storage area is being constructed by Cotting Burn to provide protection to a one-in-100 year flood standard. • Floodwater storage: Because the River Wansbeck is very environmentally sensitive, dredging is not an ideal strategy for reducing flood risk. As an alternative way to increase the river’s ability to hold extra water during flood events, flood water storage areas are being built upriver from Morpeth. These areas will serve as temporary storage for up to 1.3 million cubic meters of water. • Information center: The Environment Agency is running a public information center during the planning and construction of the flood defense system. The information center is open 4 days a week, giving the public an opportunity to gather information and voice their concerns, and giving agency representatives the opportunity to answer questions and build public trust. • Stormwater management: The Environment Agency is also providing technical support to the Northumberland County Council for the development of a surface water flooding scheme. Data gathered for the creation of the river flooding strategy will aid in the development of this second, complementary flood alleviation scheme. • National/Local funding partnership: After this program was denied funding from the National Flood Defence Grant in Aid for 2011/12, the Northumberland County Council committed to contributing between £7 – 12 million towards this £21 million scheme. This commitment helped the Environment Agency secure £10.6 million from the national government through other funding streams. • The flood alleviation project started as an initiative of the national Environment Agency, but after the flooding event of 2008, the EA included local partners in the planning process. The EA also reached out to citizens to participate in the process. 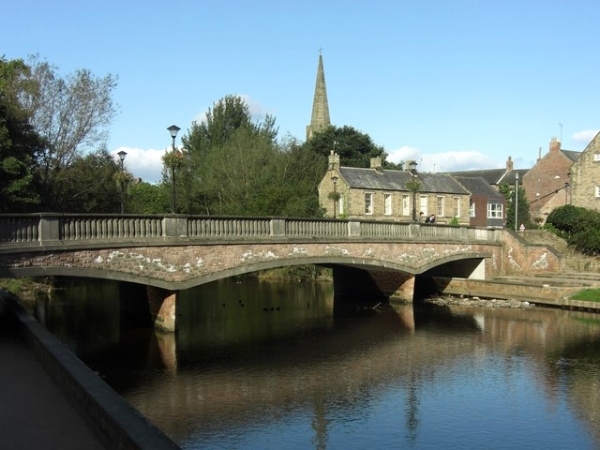 Morpeth in Northumberland is a great example of how a partnership approach is facilitating a comprehensive solution for reducing the risk of flooding in the town, not only from the river but also from surface water and drainage in the town. In Morpeth, the EA was able to leverage local funding to help cover the costs of new flood protection infrastructure when national disaster aid funding fell through. Recognizing specific local benefits and the importance of flood protection to the local economy helped the local government commit to sharing some of the costs of the project. Having a portion of the necessary funds committed to the project, whether from a local, state, or national government, it may be easier to receive grants or apply for other funding. Such was the case in Morpeth. In Morpeth, the EA ran a public information center – a storefront where citizens could gather information and ask questions. This seems to have helped build local support for the range of flood protection projects. The flood storage areas have been questioned and challenged in court in other parts of England, but the implementation of the storage areas in Morpeth has been relatively smooth.